Sony has been playing up its new handheld gaming rig for a while now, but today is when the SKUs hit the shelves: Sony’s PSPgo portable gaming system is on sale at North American retailers for a suggested price of $249.99. 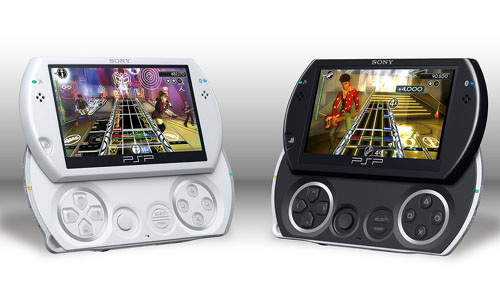 The PSPgo features a 3.8-inch display that slides up to reveal gaming controls, 802.11b Wi-Fi (for connecting to available networks and the PlayStation Network), and Bluetooth wireless networking (for handling headsets or Dualshock controllers). What’s missing? Sony’s little-loved UMD disc drive, which helps the PSPgo be over 40 percent smaller than its predecessors. Sony plans to make up for it by offering full-length portable game titles via the PlayStation Network. Sony is, of course, offering a plethora of new gaming content on the PlayStation Network to support the launch, including Gran Turismo, Motorstorm Arctic Edge, and PixelJunk Monsters Deluxe. Overall, Sony claims more than 225 full-game titles are available for the PSPgo via the PlayStation Network, along with more than 16,000 other content items like movies, TV shows, PSOne games, and comics. The units even come with a Rock Band Unplugged Lite voucher, just to get people started on the path of buying into game franchises. The PSPGo features 16 GB of onboard flash memory, along with Memory Stick micro card support so users can sideload titles, photos, and other media. Users will be able to leverage the Bluetooth capabilities to listen to music via a compatible Bluetooth device, as well as tap into Internet radio and use headsets with VoIP services like Skype. The PSPgo also includes Web browsing capability, so enabling users to access online video and other services. An open question is whether Sony can succeed with the PSPgo again the likes of the iPod touch and the Nintendo DSi: Nintendo has always seemed to have the edge amongst casual gamers (and the DS family has always outsold the PSP line), and Apple has captured significant mindshare with the iPod touch…whic starts out at a lower price point than the PSPgo. On the other hand, for the time being Sony arguably has the edge in terms of game content, and for folks looking for a portable gaming experience, the content is about all that matters.